Dinner pulled together in 1 hour for 5 adults and 7 kids. I always love spontaneity (little planning, quick food) and variety (choices! ), especially in dinners with good friends and all of our kids running around. A big spread of colorful dishes pressures kids (AND adults) to try new things as they graze the night away. First, set the grill on High. Marinate thick fillets of Tilapia at room temperature in granulated garlic, salt and pepper. Coat with olive oil before putting on the grill. Grill one side until golden with black grill marks, about 4-6 minutes (grill cover closed). Then turn the fillets over and leave on for another 1-3 minutes. Take the grilled fillets and arrange on plate. Pour Nuoc Cham dressing (recipe below) along with scallion, cilantro and cut tomato over the grilled fish. Serve while warm. This dish is fresh and light and FULL of flavor. Perfect over white rice. Left-overs make the PERFECT sandwich...a toasted baguette, small smear of Grey Poupon, bunch of cilantro sprigs and slices of cucumber. Next day's lunch for and hubby and Zach! 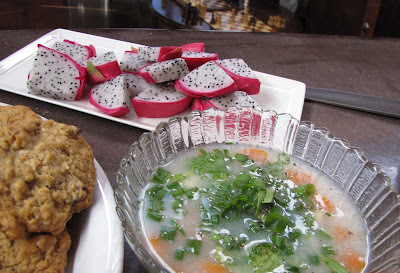 Dessert - Not one, but TWO tapioca dishes! (1) First one is EVERYONE'S favorite: tapioca pearls and tapioca strands (awesome chewy texture variety) in coconut milk (add sugar) with sliced Asian Banana - don't know what to call this particular banana which isn't even a plantain (scroll down for picture)?! (2) The second one has the same coconut milk, tapioca pearls and strands, but also contains 2 varieties of Vietnamese sweet potato, some mungbeans and strips of seaweed (texture galore!). Here is what the bananas look like. The peel is VERY TOUGH, like, must-use-a-knife tough. And it must get at least half BLACK to be ripe enough to cut through the peel. A very tough banana. Not a plantain, see?